For the last few months, I am updating my lipstick collection with various shades of reds, pinks, peaches, and neutrals. In this process, I am experimenting with a lot of affordable bold lip shades that are wearable as well. Previously I dreaded orange and fuchsia lipsticks since I used to think they attract a lot of attention. 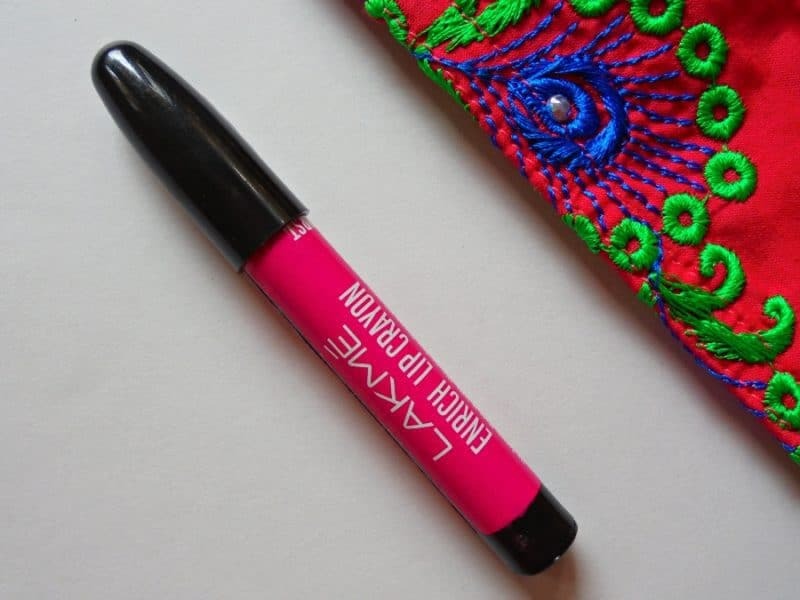 I am more comfortable with such shades now so I got the 6th shade the Lakme Enrich Lip Crayon 06 Pink Burst . This lip crayon range has already created a strong fan base due to its great quality and super affordable price point. 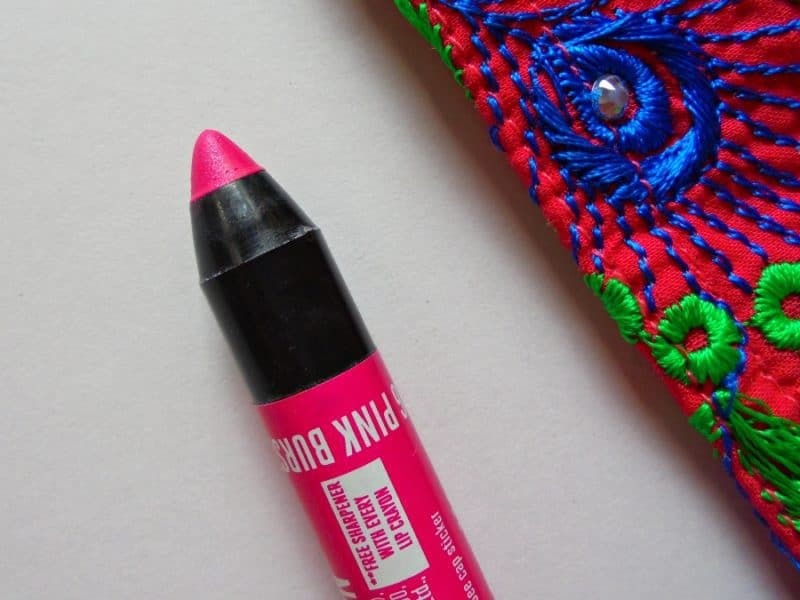 Keep reading to get my point of view regarding Lakme Pink Burst Lip Crayon. 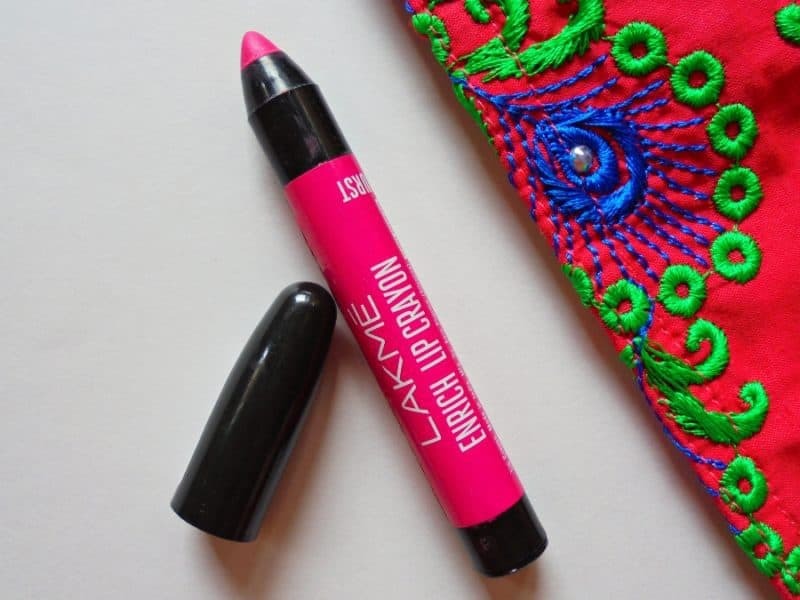 The Lakme Enrich Lip Crayon is a crayon form lip color with soft texture and smooth matte finish. High level of mineral powder in the formula provides the soft matte finish. Olive oil and jojoba oil supplies the required moisture to condition the lips. Packaging- This lip crayon comes in a sharply black pencil. The pencil has a black plastic lid to secure the color from getting messy. The shade name, manufacturing details and expiry date are mentioned in a paper flap that has been glued to the body of the crayon. All the shades from this lip crayon range come with a free sharpener. The quality of the sharpener is quite good. I find this short chubby pencil both travel-friendly and user-friendly. Shade- The shade Pink Burst is a cool toned bold pink with shimmers. The glitter particles are not of the chunky kind; they are very subtle and give an overall glossy look to the lip color. The shade is very pretty and feminine. This kind of bubbly pink color gives a fresh look to the face. Pigmentation- Pigmentation wise this one is a great shade to have from this range because it gives full coverage to my medium pigmented lips in 2 swipes. 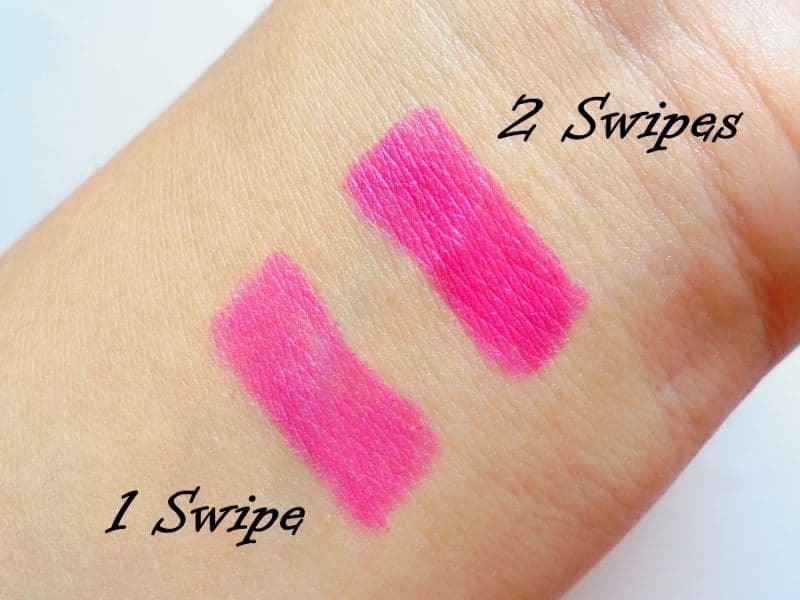 Those who have more pigmented lips than mine will need one more swipe to get the full opaque finish. Texture & Staying Power- This lipstick has creamy matte finish just like all the other lip crayons from this range. The creamy part of the formula helps the color to apply easily without any harsh rubbings. The staying power is also good. This lip color stays put for at least 4-5 hours without meals. Then the color starts to fade. After 6-7 hours the color looks like a lip stain with a little bit of glitter. Fragrance- All the lip pencils from this range has a distinct floral fragrance, this one being no exception. The fragrance is not too dense and stays for about 1-2 hours. Elle 18’s matte lipsticks smell exactly similar to it. Experience- Though I like a little warmth in my pink lipsticks, I cannot deny the versatility of this cool shade of pink. It works across skin tones. 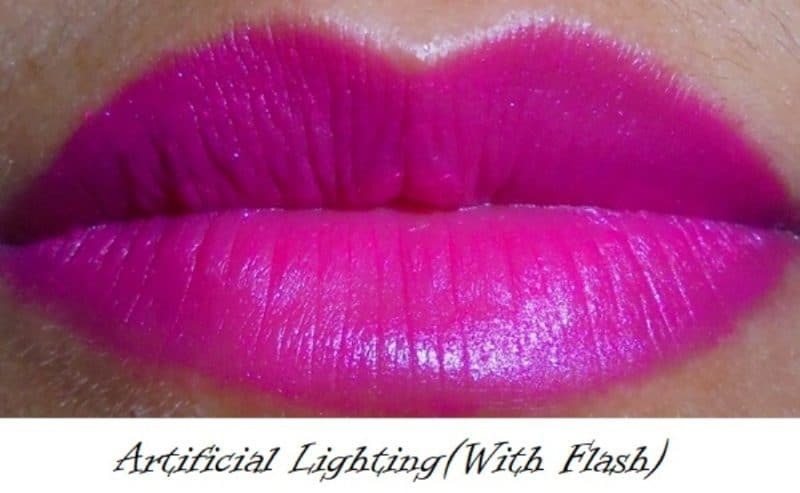 For lighter skin tones it is a true fuchsia lip color but for deeper skin tones it becomes a more wearable shade of pink. I like to use this crayon as a lip color but sometimes I use this for lining my lips before applying cool pink lipstick. Since it is a creamy matte finish product you need to blot off the cream part to use it as a lip liner or the lip color would not stay long. Blotting also helps with the transferring issue of this lip color. Thankfully it does not have a colour bleeding problem. This lip crayon is something I reach for when I forget to do my usual overnight lip moisturizing ritual. This crayon does not make the lips dry; it keeps my lips moisturized instead. I am enjoying the non-greasy formula of this lip color. Would I Repurchase or Recommend? I would like to recommend Lakme Enrich Lip Crayon Pink Burst to everyone who wishes to try an affordable bold fuchsia with cool undertones. 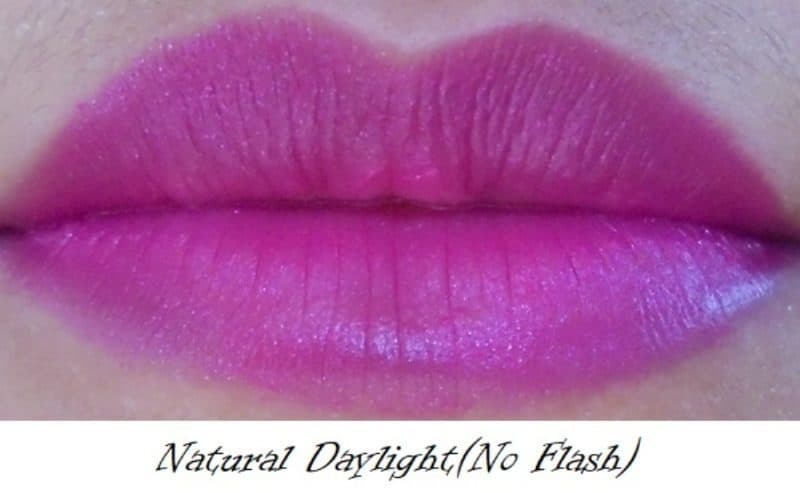 I personally am a lover of warm-toned fuchsia shades so I am not going to get another one of this particular shade but I will definitely buy the warm fuchsia from this range called Shocking Pink. Perfect swatches and as usual great review. You have mentioned that it is not natural / vegan/ organic. I really wanna know that from where did you vwt the info. I’ll have to quit using it after reading that it’s not vegan. Please provide some more proofs. Thanks for mentioning this point 🙂 . I should have been more specific regarding this issue. Like most other Lakme makeup products the ingredient list was not given in the packaging as well as their website. So, there is no way to draw definite conclusions about its being vegan or natural or organic. From my experience of using this particular lip crayon and other makeup, skincare products, I can say that the pigments and the fragrance producing products are neither organic nor natural. Most other easily available makeup products also have similar feel to them. Even many famous high end brand products are not naturally prepared in that sense. I generally take a thorough look at the ingredient list before buying anything for my skin and hair. Apart from some harmful chemicals, I do not mind skin friendly stable chemicals. If you find more information regarding this issue please share. I also want to dig deeper into this issue.